Introducing Uncloudy Skies, a simply shaped, long sleeve tee with an elegant back-dipping neckline. Its sleeves and lower bodice are worked in the wonderfully floral Lace Entrelac, an easily memorized 13 stitch by 12 row repeat. I-cord bands trim its edges. This design is worked top down, extending straight and seamlessly from underarms to hemline, with lace flaring slightly at its lower bodice. Top-down sleeves are worked flat and set in. 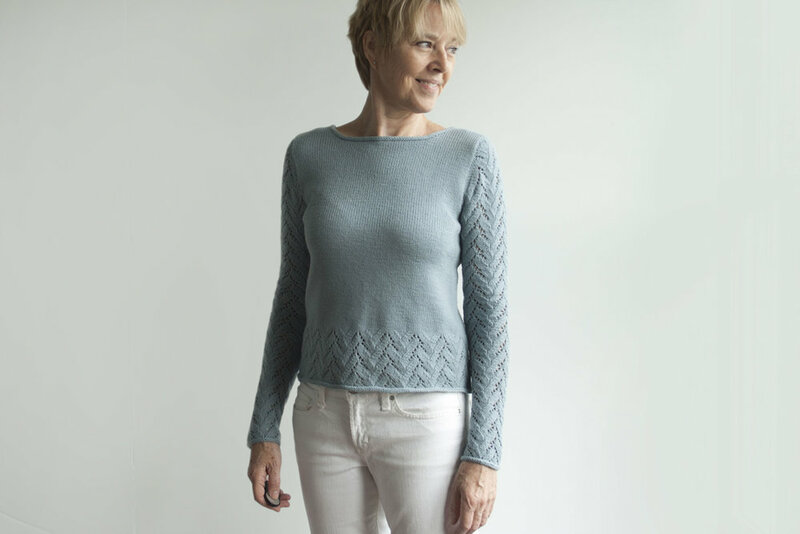 You'll find all lace shaping of the sleeves charted – making this a perfect project for knitters of all levels. Enjoy! Shown in Chickadee wool by Quince & Co. (100% wool; 181 yds / 166m per 50g skein); color – Bird's Egg #106; 6, 7, 7, 8, 9, 9, 10 skeins, or for comparable yarn, approx 1010, 1125, 1255, 1375, 1510, 1630, 1750 yds / 925, 1030, 1150, 1260, 1380, 1490, 1600 m.
Long-tail CO, Knitted CO, circular knitting, decreases (ssk, k2tog, k2tog tbl, p2tog, p2tog tbl), increases (yo, pfb, kfb), stitch pick up around neckline, short row shaping at shoulders and sleeve caps, blocking, seaming (sleeve), setting in sleeve caps, and I-cord BO. • a 4 page Supplemental Materials PDF for each of 7 sizes, that includes sleeve charts with guidance on modifying Lace where partial repeat sets exist.